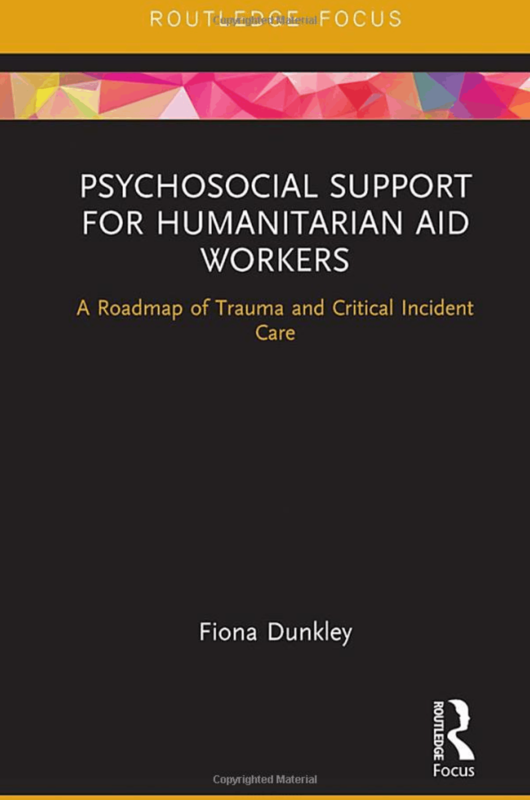 Fiona Dunkley gives us a small, accessible book aiming to “psychologically prepare, strengthen and build resilience of aid workers by encouraging good psychosocial care practices for staff exposed to the humanitarian aid sector” (pxii) through balancing theory, research and personal stories. I feel the need to disclose two things up front. Firstly, I’m not a humanitarian aid worker, nor am I familiar with the field; indeed, I am not somebody the author would consider a “trauma specialist therapist” (p25). Secondly, one of the longest acknowledgements in the book is for Beth Glanville, the reviews editor of Contemporary Psychotherapy, and while this hasn’t altered the review knowingly, it needs to be mentioned. Dunkley divides her book into eight chapters, after a useful preface where she defines who the book is for: “anyone whose work involves direct or indirect contact with traumatic material, those living with or close to someone with post-traumatic stress disorder (PTSD), any individual who is suffering or has recovered from trauma, or anyone who has a general interest in trauma work” (pxii), as well as offering some definitions which prove useful. One notable omission from the terminology section is a clarification of the differences or similarities between terms that relate to psychotherapists. There is some inconsistency here, which could be confusing to some of her target groups. 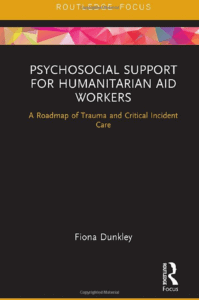 The introduction, chapter 1, gives an overview of trauma, aid work and the need for this topic of discussion to be had with statistical evidence as to the prevalence of trauma for aid workers; it provides more than an adequate justification for the book. Chapter 2 looks at the physiology of trauma, including signs that trauma could have happened and the first individual examples. I discuss Chapters 3 and 4 in more detail below. Chapter 5 examines the psychosocial management of critical incidents, including the potential use of family support, debriefing and assessments, and considers the concept of organizational trauma, and how cases, and people, can be affected, with the emphasis on what an organization can do. Chapter 6 offers an organizational perspective looking at “the complete package of care” (p76), specifically what can, and should, be done for aid workers pre-, during and post-deployment. The book moves from the general into the specific considerations required around culture in chapter 8, and strongly advocates the use of peer support, as well as the need to recognize, as an organization, that cross cultural work is difficult and challenging. The final chapter, the conclusion, offers a rounding out, as well as some hope from the previous case studies of how those affected have moved on. Squeezed between the conclusion and the references is a seven-page section called “sources of help”, which offers details of organizations and websites where readers can find support. The only downside is that it isn’t consistent in terms of listing, with some sub-sections alphabetized while others appear random. For me, the most interesting chapters focused on therapy and ‘interventions’ specifically around treating trauma and the resilience toolkit: chapters three and four respectively. The idea of a resilience toolkit is useful, accessible, clear and open to everybody and gives a clear pathway for how to help. It builds more generically on the previous chapter, which gives two worked examples of therapy with clients using EMDR and Trauma-Focused CBT. If anything, I felt the verbatims were a little too short, and lacked something approaching realism in terms of silences, pauses and intersubjective engagement. But I feel this is a nuanced criticism based on my being a therapist, and ultimately the length and style of the verbatims don’t detract from the examples of the methodologies used. In this sense, these examples offer a clear, short term, step-by-step approach of how to work with a client to process their trauma, as well as illustrating the differences between the two methodologies. As an introduction to the two different methods of working, neither of which I’ve experienced, I found it useful and an enticing way to potentially expand my integration. “I was attacked in my early twenties and spent several episodes in therapy trying to manage, what I came to know, many years later, as post-traumatic stress disorder (PTSD)” (p13). This felt an important disclosure, which was hinted at in the introduction. In being totally upfront about her own experience, Dunkley sets up her research as being personally owned, rather than simply an academic exercise, which helps the feel and tone of the book. Two ways of including first hand experience are used, with some interweaving of individual stories to supplement more theoretical points, along with stand alone case studies of high profile trauma victims, located in chapter five. Together these add huge value in terms of colour, experience and emotion. I felt like I wanted more at times, especially around engagement with the wider literature and the different views that are held in the field. One such example is the reference to Steve Peters’ book The Chimp Paradox (2012), which runs to a line and doesn’t acknowledge how he departs from other authors. Similarly, I didn’t get a sense of whether Dunkley feels disclosure to her clients around her own PTSD diagnosis would be helpful. I feel getting her view on this would have really helped the text assist therapists, or indeed any of the other target audiences. She makes the wonderfully clear point that “after a traumatic incident, individuals are highly sensitive to comments from friends, colleagues and managers” (p22), but this isn’t expanded to therapists explicitly, and I’m left wondering whether a disclosure of having had a similar experience could be dangerous or not. As somebody who is towards the anti-psychiatry end of the spectrum of belief in the medical model and attitudes towards psychopathology, I was troubled by some of the language, and the lack of critique of some things advocated by the DSM. She writes, for example, that “trauma specialist counselling is usually offered one month after the incident” (p72). This was somewhat rectified with the later acknowledgment that “some clinicians would argue against labelling or pathologizing individual’s health difficulties” (p77), but there could have been more detail about why this may be. That said, Dunkley gives her personal perspective based on her professional and personal experience as to why the diagnosis is useful in “creating awareness, funding, research and specialist trauma treatments” (p77). This is a sound argument, but I wonder whether it would be reinforced with more of an alternative perspective to balance it. So, as a reviewer from a second tier of readership, the therapist “interested in trauma, and working with emergency first responders” (p. xii), how do I feel about the book? Clearly there are major concerns for humanitarian aid workers, and as a member of society, and somebody who used to do some corporate risk management, I feel shocked, dismayed and upset that such helpers are routinely not helped by their organizations. I feel touched and moved by many of the case studies discussed, and I have a greater awareness of the potential damage well-intentioned, but uninformed, therapy can do to people ‘with’ PTSD. I’ve also gained a good insight into what working with trauma can look like from a prescriptive, methodological view. I feel Dunkley has done what she set out to do, as much as I can judge as a non-aid worker, and she’s advanced the literature in an accessible, enjoyable way. Ben Scanlan is an Existential Psychotherapist and Coach in private practice in London. He has worked in the NHS, in sport and the charity sector and has an interest in working with men, those considered “other” by society, and suicidal clients.